Yesterday I wrote about the “hidden” esoteric side of many Dutch artists. Since this is a deep interest of me, I try to collect all the recordings that are made in this field. I cannot afford all the original records, but I am quite happy with a tape or a CDr too. And sometimes I do get the original records. Like the rare LP made by the Insekten Sekte, het Resistentie Orkest en het Deskundologisch Laboratorium in 1970 or 1971. It is a bit unclear to me what these organisations really stood for, but based on the names of the people who were in it, I guess it were most of all just names. 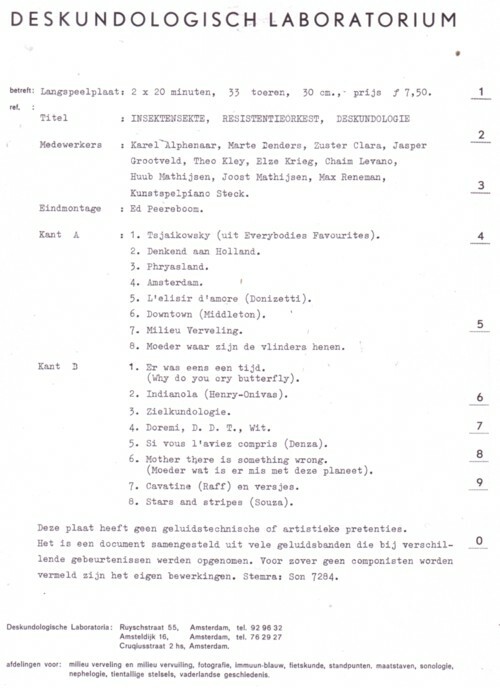 There are many other organisations/ names associated with Robert Jasper Grootveld, Theo Kley, just to name two people that participated on the LP. Het Amsterdams Ballongezelschap or de Nieuwe Zotten, for example. To be honest: the LP is mainly a bunch of crap. Random recordings of pieces of music, poems, interviews, and other sounds by people who played a role in the 60’s Provo movement in Amsterdam. I happen to have an interest in this type of crap, but I fully realise that most people can happily live without it. Here is Robert Jasper Grootveld, talking in his typical way, as he did every week in the late sixties at the Spui, for an audience of mind-a-likes. Man, i wished somebody dug up some recordings of these speeches!